Magnolia blossoms are beautiful harbingers of spring, but they're fragile and can be glorious one day, gone the next. Our wilt-free solution? Mix real leaves with gorgeous paper flowers. To create these stunning centerpieces, we placed several stems of crafted blossoms in tall white cylindrical vases, making sure to vary the height of each for visual interest. Combined with white table settings and sleek glassware and flatware, the arrangements look crisp, modern, and refined -- not bad considering how inexpensive each centerpiece is! You can easily purchase magnolia stems and craspedia (commonly known as billy balls) at most florist shops. 1. Using our template, cut crepe paper into eight petals. 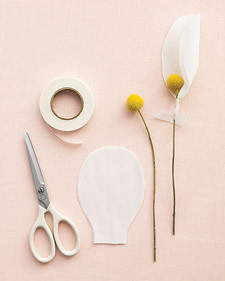 Scrunch bases of two petals together and attach to a stem of craspedia with white floral tape. Repeat four times. 2. 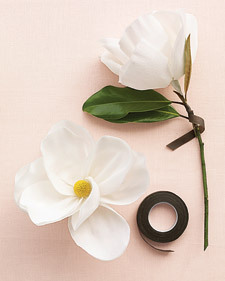 Fasten short piece of magnolia branch to craspedia stem with brown floral tape. Stretch petals into cupped shapes. "Lotus Root" cylindrical vase, by Bo Jia for Middle Kingdom. Crepe paper, D. Blumchen & Co. "Ellipse" flatware, by Calvin Klein Home, macys.com.